Asheville Business Blog: DWT presents "A Holiday Sing Together: Winter Songs"
DWT presents "A Holiday Sing Together: Winter Songs"
The Diana Wortham Theatre in downtown Asheville announces the holiday edition of Intersections Sing Together: Winter Songs, Friday, December 11 at 6:30pm in The Forum at Diana Wortham Theatre. This popular edition of the Sing Together series invites participants to slow down during the busy holiday season and spend an hour singing with family and friends. 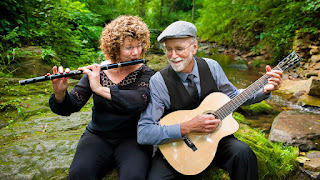 Led by musicians Beth and Jim Magill, Sing Together: Winter Songs’ participants will learn seasonal songs to share with the entire family, regardless of religious affiliation. The young ones can make a snowflake at the craft table to take home. The 2015/2016 Sing Together Series, which runs through April 2016, is designed for family and friends to celebrate the joy of music and singing in spirited sessions, bringing community together through song. All skill levels are welcome; no experience is required. The Forum, a large, multi-purpose space adjacent to the theatre and accessible from the theatre’s main lobby, is the venue for all Sing Together events. Seating is limited; advance purchases are highly recommended. Musicians Beth and Jim Magill lead the Intersections Sing Together series, which launched in 2012. Beth is a professional flute and tin whistle player and teacher. As a studio musician she has appeared on numerous recordings and NPR’s Mountain Stage. Jim is an award-winning songwriter and instrumentalist on guitar, cittern and mandolin. He is the founding Director of The Swannanoa Gathering Folk Arts Workshops at Warren Wilson College, and in 1994 was awarded the first Fellowship in Songwriting and Composition from the North Carolina Arts Council. Other upcoming 15/16 Sing Together Series events include: Freedom Songs & Spirituals with guest artist Becky Stone (February 12, 2016), a vibrant song-filled exploration of that great network of passengers, conductors, shepherds and stationmasters on the Freedom Train; and Circle & Improvisational Songs with special guest Susan Lachmann (April 22, 2016), an evening of spontaneous vocal inventions in the circle song format. All Intersections Sing Together sessions take place at 6:30 p.m. in The Forum at Diana Wortham Theatre. $10 adults/$8 children 12 and under; children 2 and under are free. To obtain more information on the Diana Wortham Theatre’s Intersections Sing Together Series or to buy tickets, call the theatre’s box office at (828) 257-4530 or visit http://www.dwtheatre.com/intersections-sing-together.